Over The Moon attended this years Event Show at Olympia in London. We’ve been to the Showman’s Show for a number of years but this was our first visit to the Event Show. For tent related suppliers it was disspointing and there was not as many trade stands as at The Showmans. Where the Event Show scored was on its speakers and this year (as they did last year) Michael Eavis, promoter of the Glastonbury Festival, was speaking for an hour and a half on the history of the festival, plans for this years 40th year anniversary and answering questions. During the course of the session Eavis revelaed that 2009’s Glastonbury Festival donated £2million to charity. A big increase from first year Eavis donated his profits away that was in 1981 and he gave £20K away to CND. His genorisity was costly as he then faced a £7K tax on the gift. He revelaed that security costs £3.2 million of which £1.2million is for the Police. There will be no Glastonbury in 2012 as the Police are busy with the Olympics and cannot cover it. This is a shame as 2012 has a lot of resonance with the end of the Mayan calendar. Eavis also revealed the event cost £25m to put on each year, with most of the money going to securing the perimeter. Each year seven local farms are taken over to produce the festival, which is again expanding in size this year to accommodate people’s appetite for larger tents. There are also discussions to ban large flags at the event in an area in front of the stage. Eavis said he was keen to clear a line of sight for the sound desk but his daughter, Emily, who also runs the event, wanted the flags to stay. Eavis thought they did add to the spectacle of the event especially for TV. For my pennie’s worth I thought they were great for a sense of pageantry and atmosphere when Springsteen played on the Saturday night. Eavis has a jovial, stuttering delivery and couple with his ancedotes and self deprecating humour makes him very endearing. I liked his description of the security fence having a ‘rat catcher’ overhang like on hayricks to prevent people/rats getting access. Eavis claims Glastonbury’s appeal is in its long history which has run concurrent to lots of social change and the Festival reflects that history. There were quite a few prospective festival organisers in attendance and they did not miss an opportunity during the Q&A session to mention this and to ask for advice. Eavis claimed that the small scale of the event and it not having a lot of H&S issues to deal with helped a lot to get it off the ground. It took 11 years to make a profit. He believes a festival needs integrity and a hook to attract performers and punters. One organiser was exasperated at trying to get Travis to play at his Scottish community festival so Eavis offered to call the band on his behalf! No2 was a wooden wheel abandoned by the couple wheeling it all the way from John O’Groats to Lands End. The couple called years later to ask for it back, and then moaned when it was in a bad state! He said that it was probable that Stevie Wonder will headline the Sunday (27) night. Over The Moon will be attending Glastonbury Festival again this year providing stretch tents to the Glade area. Over the past few years we have helped numerous clients put on their own festival style events. Often over a weekend these weddings and parties, used flags, musicians, outdoor lighting, performers and the tents familiar to UK festival goers. Indeed many of these clients were festival goers wanting to put their own version of a festival on using their own or hired land. As part of our new package of websites due in 2010, we decided to launch a site that specifically tailors pictures of these festival events for people interested in doing “My Very Own Festival”. Over The Moon Tents have worked at all the premier UK music festivals and have lots of experiences , as well as the tents seen at these festivals, to offer clients. My Very Own Festival’s service is provided by a group of artists, companies and festival folk to provide a range of services and not just tents. Over The Moon Tent’s were braving the rush hour hordes and crawling our way into the centre of our capital city this morning. 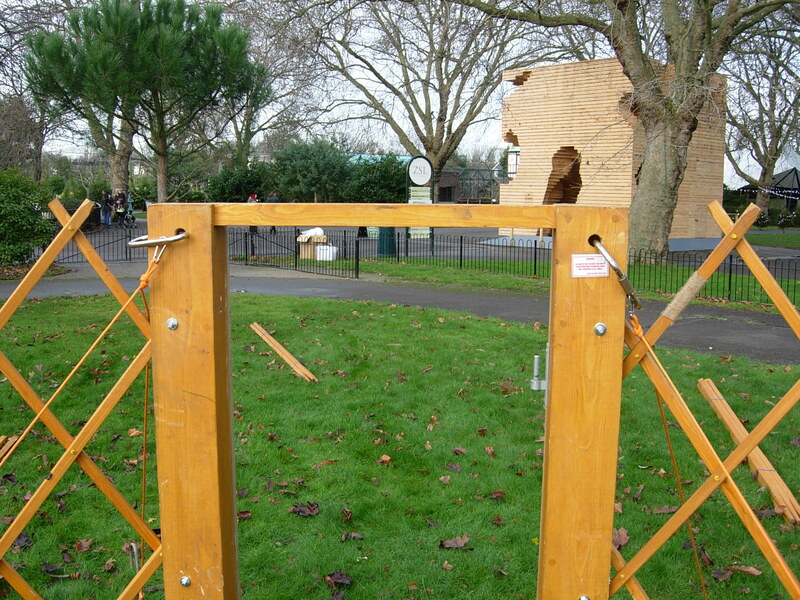 We were putting up a Yurt for the forthcoming Winter Wonderland feature which runs from the 18-24th at London Zoo, Regent Park. After the horrible wet weather of late we were blessed with a mild sunny day. The night time is ascendant at the moment and the days are short. We have still been out and about. 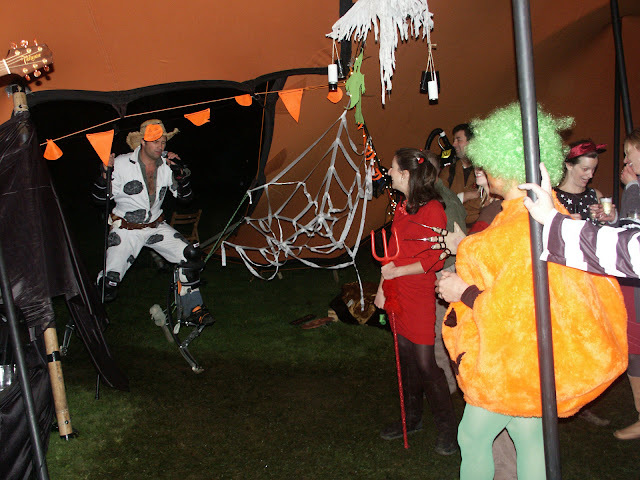 We did a lovely party down in Somerset for a 40th Birthday / Halloween celebration. The band ‘The Mad Cows’, a Glastonbury Festival favourite, wowed the crowd with their great feel good music. The interaction with the crowd , which included an improvised start to the set with a song using a throwaway comment from one of the audience, was a joy to hear. Well worth seeing or booking for a gig. Bonfire night saw us in the Cotswolds in the scenic environs of Stow On The Wold. We provided a yurt , a disco, laser lighting and glamping for a group of 12-13 year olds celebrating a birthday. Over The Moon have been out in the Sahara doing an Overland trip in our Land Rover 130 work vehicle. We took the opportunity to take along a 6x8m Intent and look at developing it for the Overland vehicle market. We got some very positive feedback from vehicle owners and will be suggesting some feature enhancements to Intent manufacturing back home in South Africa to cater for this growing market. Weight has to be kept to a minimum for Overlanding in dunes so we took no ground stakes and utilised the roof racks and jerry cans we already had with us. We also experimented with light weight poles. Drove by the site of the Shambala festival today while out and about with a tipi. Got a touch of butterflies as I looked forward to next week’s festival. Over The Moon Tents will be providing our vintage military green tent for the reggae area. While looking at the festivals’s website I got to wondering what exactly Shambala means. Not surprised to find its a meaningful word. The crew will be onsite to check the festival lives up to its name. Externally, Shambhala was a geographic location, a seat of inspiration where the Buddha taught the Kalachakra Tantra, the Tantra of the Wheel of Time. In the mythology of Bon, the native religion of Tibet, Shambhala was a Central Asian kingdom, the origin and center of the world whence issued all spiritual energies. Internally, Shambhala is the dharma chakra, located in the heart of all beings. It is the symbol for mind, completing the trinity of body, speech, and mind. The esoteric meaning of Shambhala is tathagatagarbha, buddha-nature, the essence of all things. It transcends existence and non-existence and is the ground of both samsara and nirvana. According to the Kalachakra Tantra, the Emperor of Shambhala, Rigden, waged war against and subdued the Three Lords of Materialism: the Lord of Form, the Lord of Speech, and the Lord of Mind. In the Dark Age these Three Lords extend their power and seduction, enslaving the human mind with psychological and spiritual materialism. When Shambhala is acknowledged—when buddha-nature shines through—the strategies of the Three Lords become irrelevant and the teachings of the Kalachakra Tantra are realized. Over The Moon tents has been delighted to get involved with the Blank Canvas project at this years Big Chill Festival. Inspired by seeing the spectacle of dozens of tents given to the homeless and placed along the Canal Saint Martin in Paris, artist Cedric Christie decided to create a charity project that would echo this gesture. Over The Moon provided an eight section vintage army marquee and two three section ones as the shelter and backdrop inside which the artist’s pup tents are displayed.